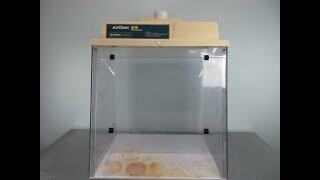 The AirClean 600 Dead Air Box PCR Workstation provides users with a workspace for the amplification of DNA and RNA, and balance applications that’s circulation free and easy to use place where it’s needed. This PCR hood features unibody poly carbonate construction and is free of gaps and joints and allows for 360° viewing. This ductless hood has two access points at the rear of the hood to accommodate instrument power cords without cluttering the work area. The overlapping sash allows you quick access or to fully open for obstruction free set up. This AirClean 600 Dead Air Box PCR Workstation has been fully inspectedand is ready to ship. Please note the blemishes at the bottom are cosmetic and don't impact performance. All of our lab equipment comes backed with our standard warranty. Should you have any questions, please don't hesitate to contact us.